The Cook's Flex Tray 626SS is made from flexible silicone, so it can't be splintered or sharpened into a weapon! 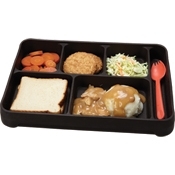 Plus, Cook's 626SS Flex Trays retain heat as well as other trays with a similar layout. These new trays have proven to be a good investment. Between our dish machine and the inmates the old style insulated trays were getting water logged and destroyed at an alarming (and expensive) rate. Although we have only had these new trays in use for 6 months they show no signs of wear or damage. They take a bit longer to dry, however they use up much less space. In the long run I think they will prove to be an excellent value.